Our first day back home and my brother's already at the house doing construction. 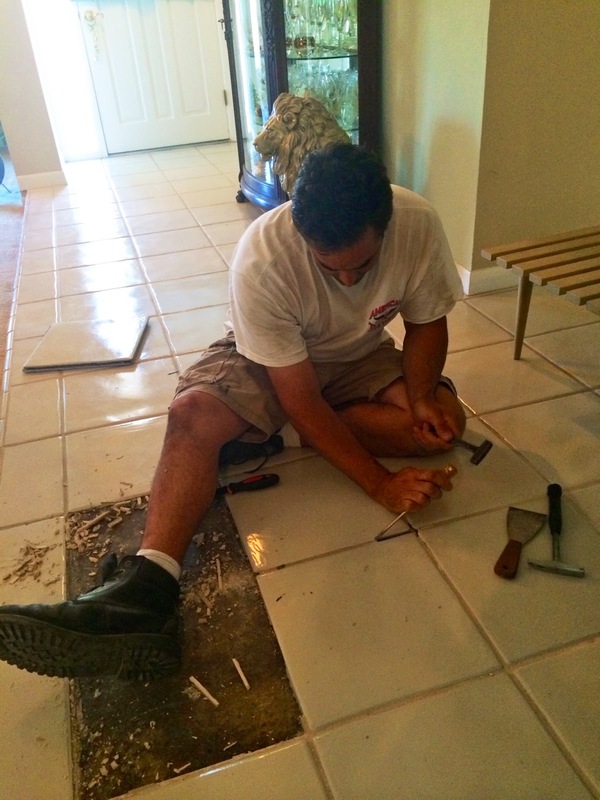 My brother is a tile contractor, and he's the one who tiled the house over twenty years ago. Just recently, some of the tile in the high traffic hallway area started to have a hollow sound to it. Then it started to give just a bit when you walked on it. Ceramic tile is not supposed to have bounce. Turns out, some of these tiles started to buckle and once he chipped them out you could see the glue on the back had dried out. He removed six total. Thankfully they didn't break, because we have no extras. He's going to grind the glue off of these, spread a little Thinset, put them back in place, and grout. It'll be good as new. And while my brother was chipping out the floor, I was taking pictures and Ed was drinking a beer. Exciting post, huh? This is the best I can do on a day that consisted of running errands - bank, FedEx, grocery store, buying a new can opener, picking up RedBox flicks - and eating lunch.